Some of the smartest things I have done have been just rushed gut decisions. When my friend Kari asked me if I wanted to attend a yoga retreat she was going to and helping teach in Lucca, Italy I just said "yes!!" without too much thought. 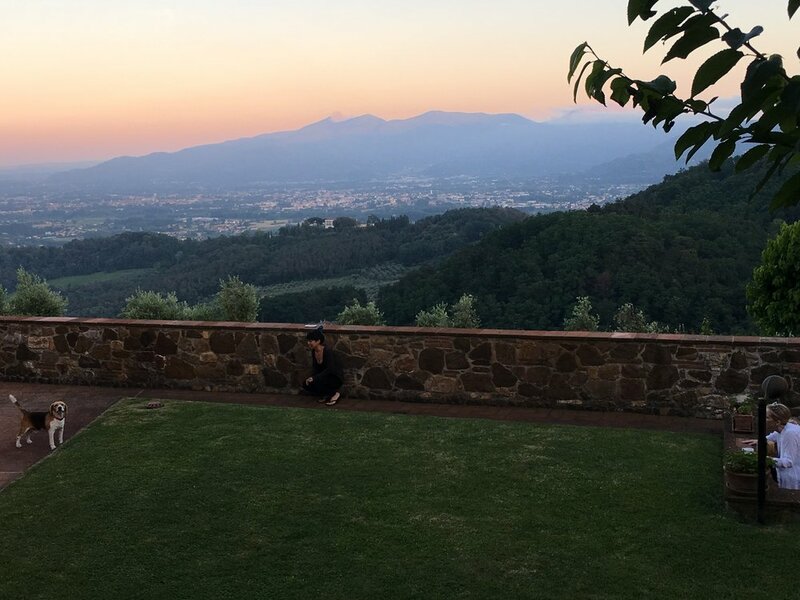 I love Italy and about 14 years ago I owned a yoga studio, it seemed like the perfect time to jump back in. My decision was simple....of course I wanted to go. I didn't put much thought into it over the last couple of months other than to contemplate the fact that I was completely out of shape. That was really my only thought. I didn't image where we would be or what our days would be like. I didn't think about what we would do or what Lucca would look like and I didn't think about the people that would be here. I'm a mom, I thought about leaving my family and preparing my business for my family to run while I was gone. I flew here overnight and didn't sleep on the plane so I was exhausted when I arrived. Which made the arrival that much more fun....numbness changed into pure bliss rather quickly. Our neighbors home we view from our pooled terrace. We were driven up gorgeous steep and curvy roads that wove through beautiful stately homes in the mountains, up and and up higher and higher until we reached our destination. 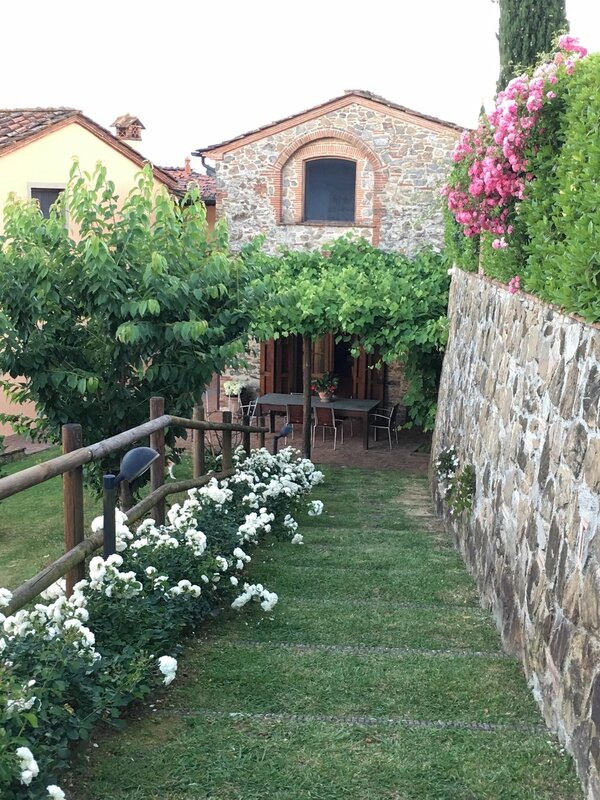 Our retreat is being held in a gorgeous mountain top villa that dates back to the 1500s. My bedroom is the one window above the trellis. The estate has several guest houses with a patio and pool and gorgeous view. This is our entrance from the street. There are 10 students, 2 teachers, and an amazing staff of helpers and cooks. I hear that the masseuse is amazing but I won't meet her until Tuesday. We each have our own perfectly appointed bedroom. Some have private baths, some have shared baths. We have a large outside dining table by the pool and a lovely common room and yoga studio. There is also a steam room and laundry facilities available for use. Our vegetarian meals are made for us and are magnificent. Our first evening we had a yoga class before dinner. It was restorative yoga and a wonderful way for all of the weary travelers to stretch out those muscles which had been jammed into airline seats and carrying heavy baggage. Our dinner last night was a homemade vegetarian lasagna, Italian bread, salad, several vegetable side dishes and a gorgeous mixed cheese platter with dried fruit and walnuts for dessert. There is a glorious bowl of a variety of ripe wonderful seasonal fruits and tea and coffee fixings available to us at all times. There is a knife and cutting board near the fruit bowl. This easy and clever idea encourages us to dig into the fabulous fruit. The apricots are out of this world! I slept like a rock last night in my lovely simple Italian bedroom. When my alarm went off at 7 am this morning I wondered, where it was I had to be. Wasn't I happily surprised when I remembered....yoga class in Tuscany! The morning was spent by all relaxing and having fun by the pool. I brought special Italian inspired paquets for the group and taught everyone who was interested how to needlepoint this morning under the Tuscan sun. It was great fun!! Two other students brought their gorgeous glass beads they make in Portland, Oregon and all had a lot of fun making necklaces. Many of us swam in this fantastic pool and some went off to play golf in Tuscany! This evening we all got to choose activities from Opera in Lucca to a road trip to another village. More on that tomorrow.